You are currently browsing the tag archive for the ‘starter’ tag. 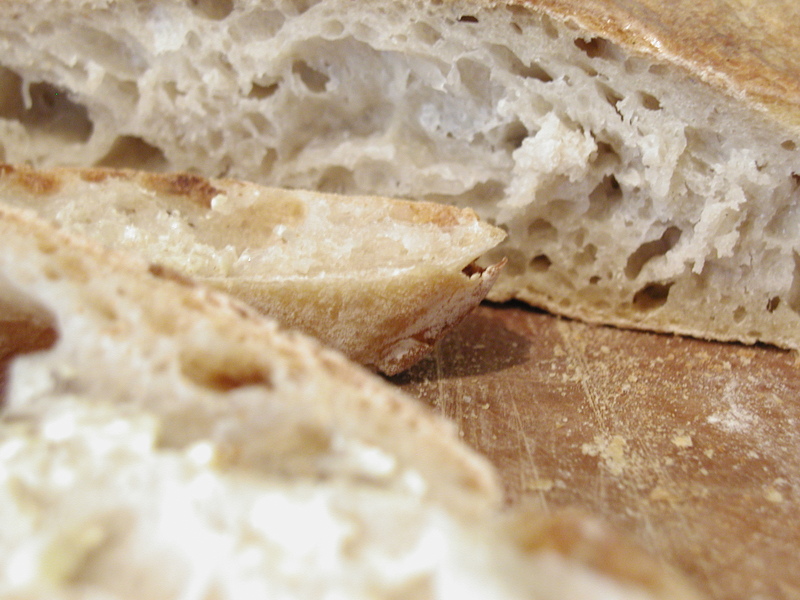 Much has been written about how to make bread using your very own sourdough culture. Much of it is at best confusing, and at worst just plain wrong. Advice to throw in all manner of extra ingredients – raisins, grapes, kefir, even yoghurt – only serve to confuse matters, when what’s really required is water, flour, air, the right temperature, a little care and attention, and – if creating a starter from scratch – a touch of luck. Frankly, though, it’s far easier to beg, borrow or buy some sourdough from a friend, bakery or online source and take it from there. But it’s the long term relationship with a sourdough where real problems often arise. People slavishly follow superstitious rituals, fearful that it will expire without them. Or they forget about the starter for a while, discover an unappetising jar with one layer of sludge and another of grey water some weeks later, and chuck the lot down the sink in the belief that’s it’s ruined. Big mistake. The truth is that sourdoughs don’t die easily. They do, however, easily go a little off the rails if left to their own devices. Which is why, in order to keep the dream alive, it pays to understand a little about what’s going on in there. Unlike baker’s yeast, which contains exactly what it says on the tin, sourdough is a little more complex. As with kefir, it involves a symbiotic mix of bacteria and yeasts. In very simple terms, one provides the sour notes, the other the gases that raise and aerate the bread. Both contribute to the final flavour, the behaviour and the general health of the ever-evolving starter. The challenge involves achieving and then maintaining the right amount and type of acidity while also encouraging good acid-tolerant yeast growth. The thing that really separates sourdough from regular bread dough is Lactic Acid Bacteria (LAB). Lactic acid bacteria are classified according to a whole range of properties, including cell structure, their growth at different temperatures, salt and acid tolerance, and sugar fermentation. The main class relevant to breadmaking is the lactobacillus. Lactobaccilus is then further divided into three different types of lactic acid bacteria: Obligately Homofermantative, Facultatively Heterofermentative and Obligately Heterofermentative. The first reacts with fructose and ferments mainly to lactic acid. The second ferments mainly to lactic acid, with pentose sugars also producing lactic and acetic acids. And the third type of LAB ferments to both lactic and acetic acid. Sounds complex, but the thing to note is that it’s last two that play the key role in sourdough, with the most dominant strain of LAB, L. Sanfrancisco, falling into the Obligately Heterofermentative category. Microflora will vary in near-infinite numbers of ways between one sourdough starter and the next, but if you’ve got L. Sanfrancisco or some equally sturdy European strain in there then it’s going to give you a good shot at obtaining both the milky lactic and sharp acetic acids, as well good stability and longevity. For this reason, you’re always going to be better off with starter taken from somebody else’s existing, healthy batch than by starting one yourself. It’s not so hard to make a starter from scratch, but you’re always initially at the mercy of whatever flora are present on the flour you begin with or are in the air nearby, and the starter’s longevity is less of a sure thing. When it comes to LAB, it’s actually water content rather than temperature that plays the dominant role. The lactic acid production isn’t particularly affected, but acetic acid production is. The more fluid the sourdough, the lower the acetic production. In other words, if your starter is getting too vinegary then try tempering this with a more liquid-like consistency for a few days. If it’s not sharp enough, then go for a firmer mix. Temperature does still play a part when it comes to LAB. Happily the ideal temperature for the growth of the LAB is still same as the one for its production of acid – between 30 and 35 degrees centigrade. These higher temperatures will increase the speed of acidifation. (Some types of LAB will thrive at low temperatures and others at much higher, however.) That said, it’s the lactic acid production that is increased by higher temperatures, not acetic. So, another way to tweak the balance between the lactic and acetic notes is to raise or lower the holding temperature. Which brings us to the yeast. The best temperature for the yeasts in a sourdough isn’t necessarily the same as for the LAB and acid production. Yeasts will generally thrive in the 30 to 35 range, but actually grow best in an acid environment in the 20 to 25 range, and even in this range will grow many times slower than the bacteria in the starter. (Note that yeast growth rapidly tails off above 35 degrees centigrade.) Yeast activity can also affect the behaviour of any homofermentative LAB present in the dough, with higher temperatures resulting in the more production of more volatile compounds, including ethyl acetate. If your sourdough smells a bit too much like nail varnish remover, this is why. According to Harole McGee’s On Food And Cooking, sourdough yeasts grow best in more fluid environments. The Handbook Of Food Science, Technology & Engineering, however, states that the development of sourdough yeast is poorer in fluid sourdoughs – making it necessary for professional baker’s using a thinner final dough to augment their sourdough with baker’s yeast to get the necessary rise. Certainly yeast activity is more readily observed in a more fluid starter – just remember to either thicken it up a day or two before use or else adjust the final bread recipe if it’s based on a sourdough with a standard 1:1 flour to water refreshment ratio. Note that there’s no harm in adding baker’s yeast to a dough mix for baking, especially if you need a quick rise but want some of that unmistakeable tang (though this approach does mean that the sourdough yeasts and baker’s yeasts will compete for available food). But it’s never a good idea to add it to your sourdough starter. It won’t help the balance of your starter at all, and baker’s yeasts will soon die off in an acid environment anyway. The final piece of the puzzle is the extraction rate. Often overlooked, it’s nevertheless another important aspect of sourdough maintenance. Put simply, higher extraction flours provide more available vitamins and minerals for the starter. This in turn increases LAB activity and acid production. Note that rye flours have higher extraction rates than standard wheat flours. Higher extraction rates also mean higher ash levels. Don’t be thrown by the reference to ash – it’s just a fancy way of saying ‘mineral content’. The ash content in turn results in higher available acidity in the sourdough, measured as total titratable acidity (TTA). Higher ash flours – wholemeal has around 1.5% ash, compared to many whites with around 0.5% (French T55 has, surprise, surprise, 0.55%) – therefore will acidify more quickly. That’s probably more than enough to digest for one blog entry. More next time on the practical aspects of creating, feeding, and refreshing sourdough starters next time, along with some pointers on sourdough baking, and a few good reasons why sourdough bread really is best.